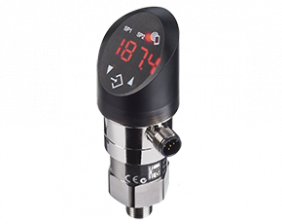 The electronic KOBOLD pressure transmitter and switch PSD with integrated display is used for continuous pressure measurement and monitoring and allows simple switching point programming without pressurisation. For each switching point, the contact function (NC contact/ NO contact), the reset points and the switching function (hysteresis/window function) can be programmed. Switching currents ranging up to 500 mA can be switched by the output transistors. The long-term proven thin-film cells give this pressure switch very good repeating accuracy and a long life, even at high load alternation. The rotating display and rotating electrical connection allow the switch also to be used under extreme mounting conditions. All wetted parts are made of stainless steel, making almost all media restrictions unnecessary for the electronic pressure transmitter/switch. The electronic pressure transmitter/switch PSD can be used for a wide range of measuring tasks in hydraulics and pneumatics.